First things first. The winner of last week’s cheribundi GIVEAWAY is…..Shay at Whine Less, Breathe More (chosen at random via RANDOM.ORG). Thank you to everyone else who participated and stay tuned for the next giveaway at Dallas Duo Bakes. Who’s excited about Christmas cookies? They are so fun and festive, and if you’re looking for a good sugar cookie recipe, definitely take a look at this one! When I visited my sister in Michigan back in early November, we did quite a bit of cooking one Saturday afternoon. 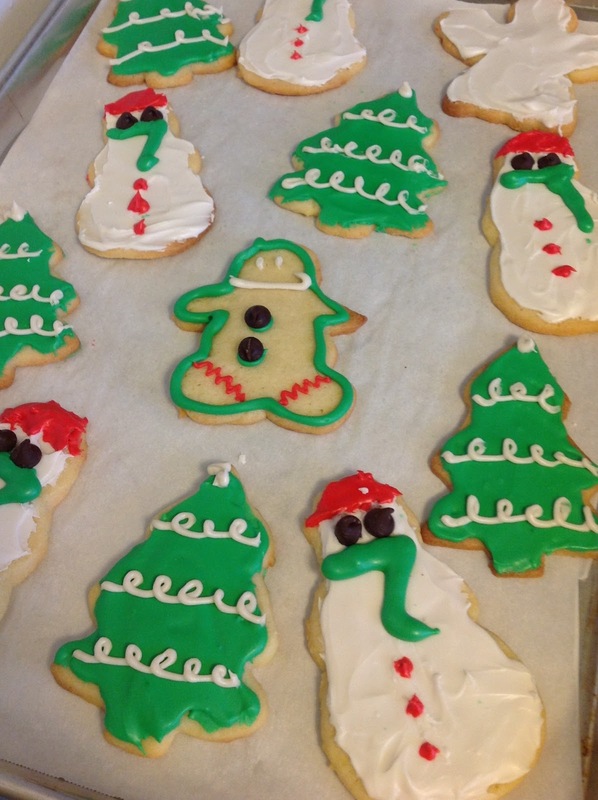 Christmas cookie baking that is… and it wasn’t even Thanksgiving yet! Since December is here, I can finally post this recipe! 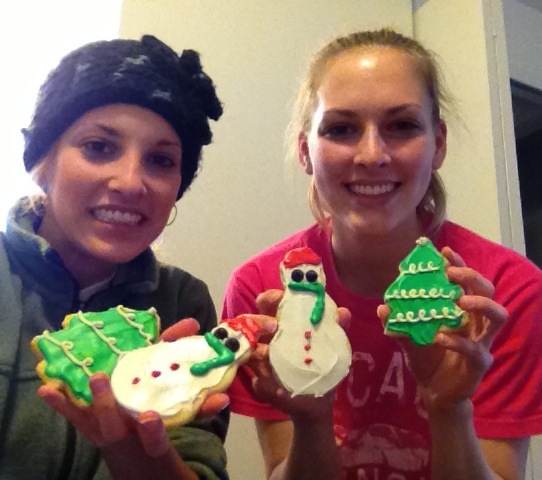 FYI – we are not gourmet cookie decorators (this was our first time to decorate cookies) so don’t judge these by the way the look. While they weren’t the prettiest, Brittany and I had still had fun piping the icing on the cookies and decorating the snowmen, Christmas trees, angels and gingerbread men. The cookies taste amazing! 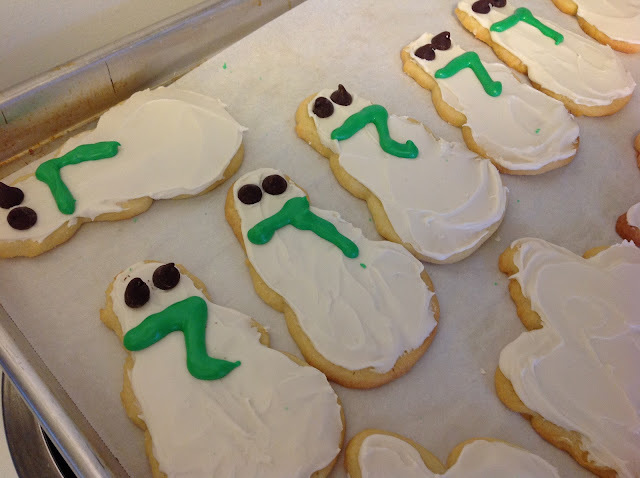 Once we get the decorating down, you’d think you’ve just eaten a cookie from Cookies by Design. Enjoy and MERRY MERRY CHRISTMAS! 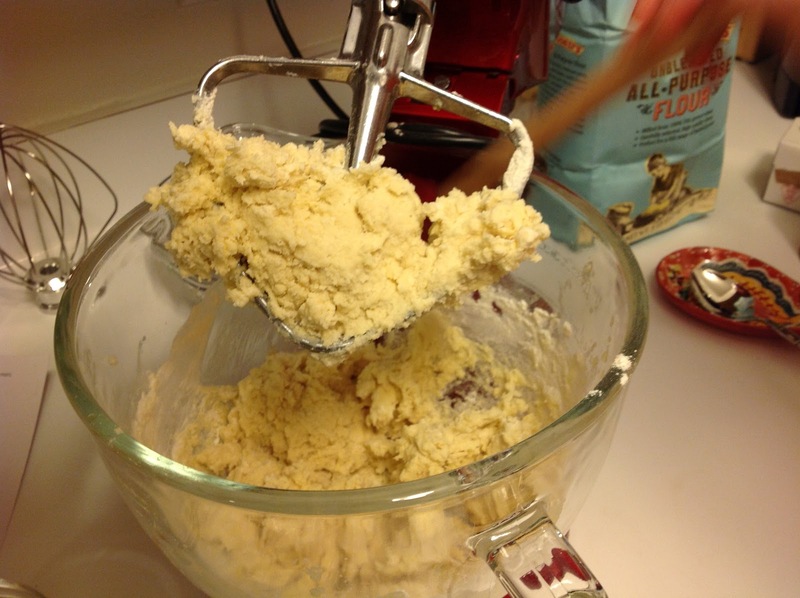 Beat the dough in a stand mixer. Wrap dough and chill for 2 hours. Roll dough into 1/4 inch thickness. Bake for 9-11 minutes in a 350 degree oven. 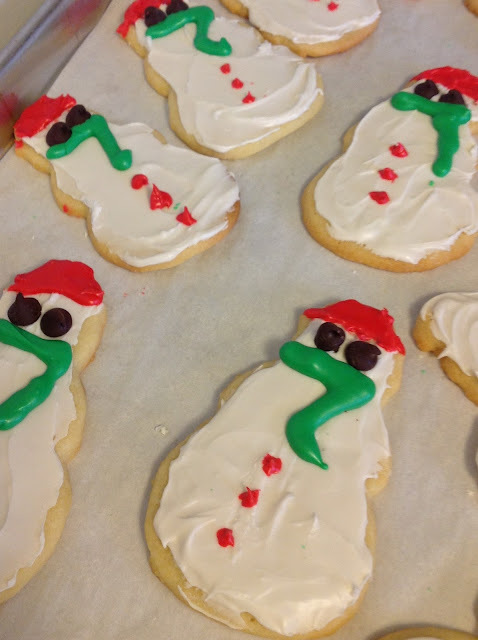 Decorate the cookies…snowmen in our case! Christmas trees, snowmen, gingerbread men and angels! 1. Whisk the flour, salt and baking powder together. 2. Working with a stand mixer, preferably fitted with a paddle attachment, beat the butter at medium speed for a minute or so, until smooth. Beat the sugar and continue to beat for about 2 minutes, until the mixture is light and pale. Add the egg and yolk and beat for another minute or two; beat in the vanilla. 3. Reduce the mixer speed to low and steadily add the flour mixture, mixing only until it has been incorporated – because the dough is best when worked least, you might want to stop the mixer before all the flour is thoroughly blended into the dough and finish with a rubber spatula. 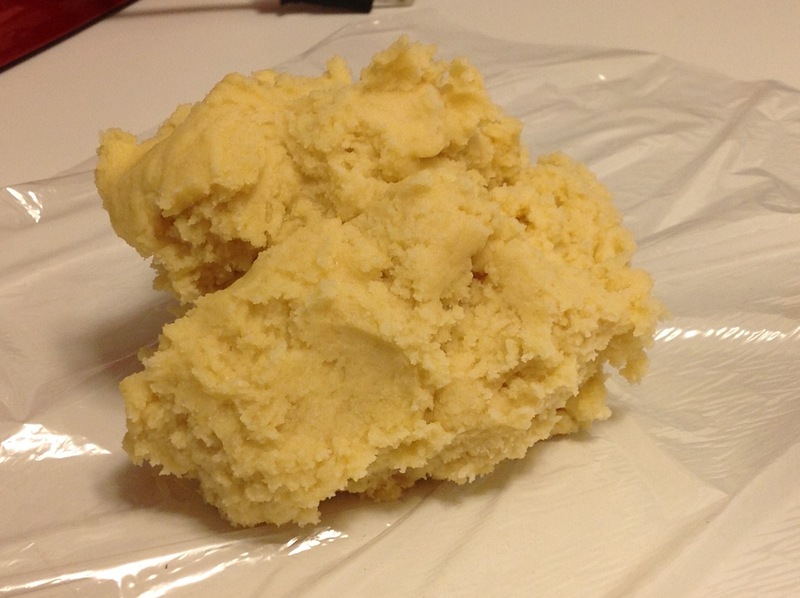 When mixed, the dough will be soft, creamy, and malleable. 4. Turn the dough out onto a counter and divide it in half. If you want to make roll-out cookies, shape each half into a disk and wrap in plastic. If you want to make slice-and-bake cookies, shape each half into a chubby sausage (about 2 inches in diameter) and wrap in plastic. Chill dough for at least 2 hours. 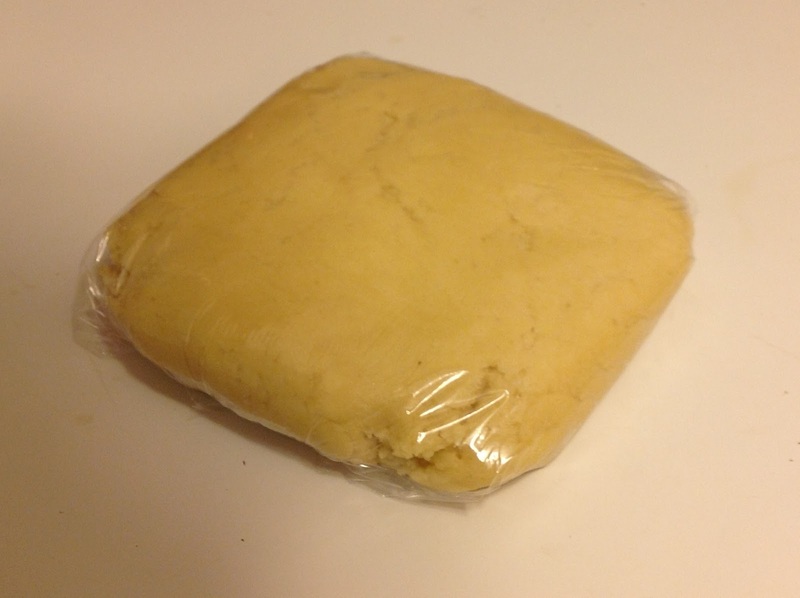 (Well wrapped, the dough can be refrigerated for up to 3 days or frozen for up to 2 months). 1. Center rack in the oven and preheat the oven to 350 degrees F. Line two baking sheets with parchment or silicone mats. 2. If you are making roll out cookies, working with one packet of dough at at time, roll out the dough between sheets of plastic wrap or wax paper to a thickness of 1/4 inch, lifting the plastic or paper and turning the dough over often so that it rolls evenly. 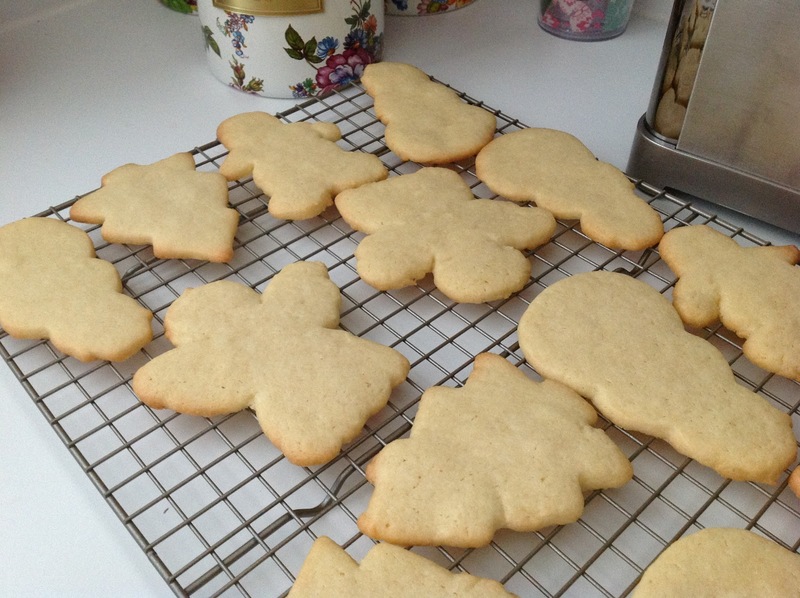 Lift the top sheet of plastic or paper and cut out the cookies. Pull away the excess dough, saving scraps for rerolling, and carefully lift the cutout cookies onto the baking sheets, leaving about 1 1/2 inches between the cookies. (This is soft dough and you might have trouble peeling away the excess or lifting the cutouts; if so, cover the dough, chill it for about 15 minutes and try again.) After you’ve rolled and cut the second packet of dough, you can form the scraps into a disk, then chill, roll, cut and bake. 3. 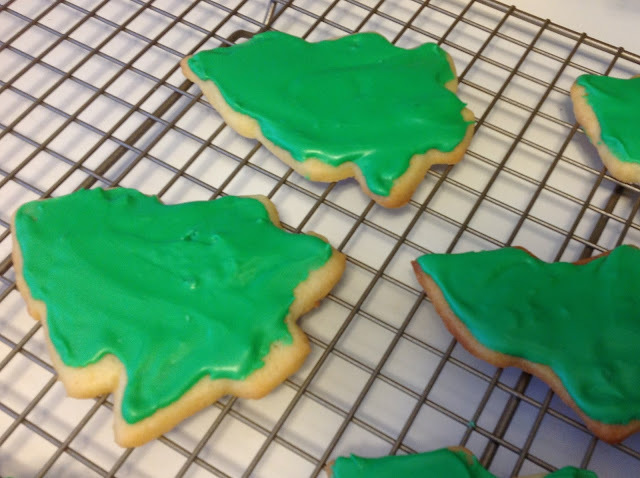 If you are making slice-and-bake cookies, use a sharp thin knife to slice the dough into 1/4-inch thick rounds, and place the rounds on the baking sheets, leaving about 1 1/2 inches between the cookies. 4. 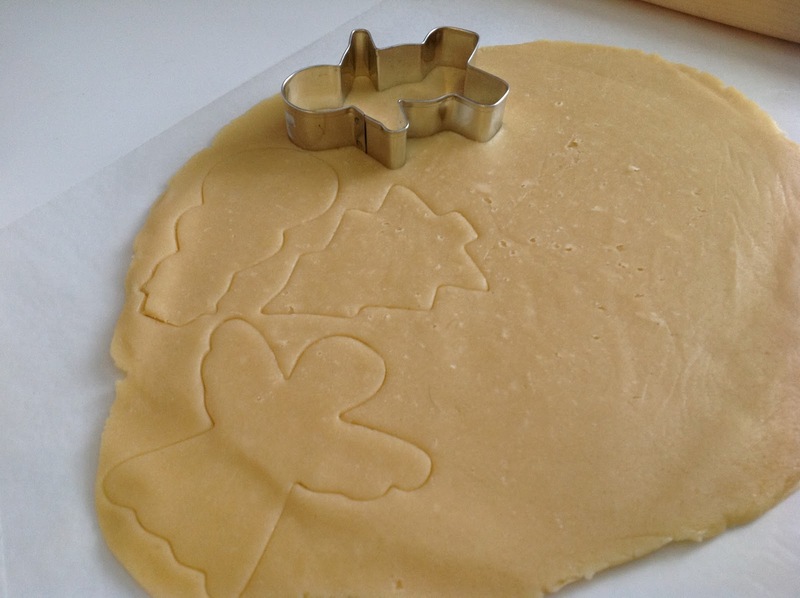 Bake the cookies one sheet at a time for 9 to 11 minutes, rotating the sheet at midpoint. The cookies should feel firm, but they should not color much, if at all. Remove the pan from the oven and dust the cookies with sugar or cinnamon sugar, if you’d like. Lest them rest for 1 minute before carefully lifting them onto a rack to cool to room temperature. Mix all ingredients on low speed for 7-10 minutes or until the icing loses its shine. Add more water by the teaspoon if it appears to stiff. At this stage you want to be able to pipe it easily. 2 Responses to "WINNER and Christmas Cookies"
Yay! Can’t wait to try these.